Do you see anything wrong here? When Sparks Electric visited this Milwaukee home this past Saturday afternoon, one of the first things I noticed was the greenfield and it was also pulled out of the connector. Greenfield is also known as “flexible metal conduit”, FMC. The FMC was installed for the A/C condenser wiring. Article 348 of the National Electrical Code, referred to as the NEC, lists the uses permitted under 348.12. It states: “FMC shall not be used in the following: (1) In wet locations. Being installed outdoors, this is a clear violation. Remember my comment about the flex being pulled out of the connector? It had some physical abuse. When it was pulled out of the connector, all or at least part of the ground system was lost. I say part because the copper tubing was still connected. 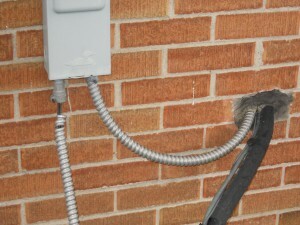 The tubing is not considered as part of the grounding system nor was it designed for that. 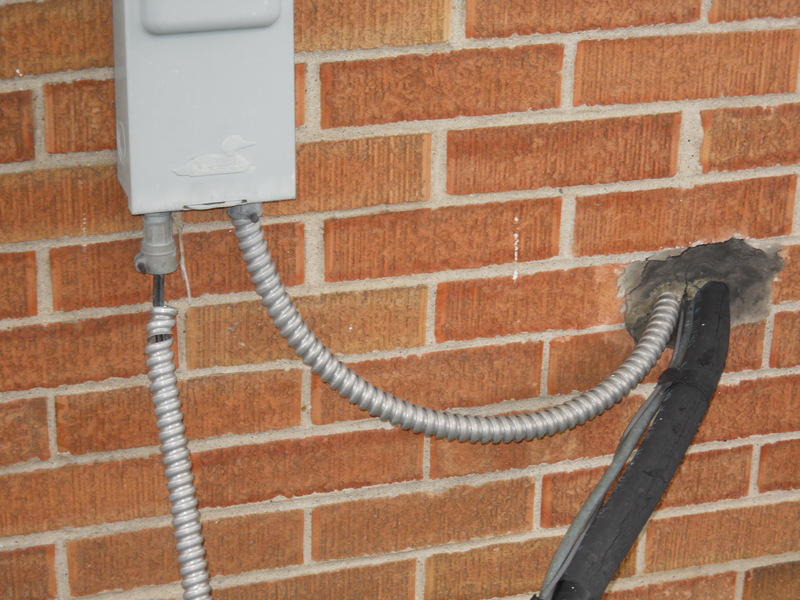 It is always best to have a qualified electrician or electrical contractor like Sparks Electric in the Greater Milwaukee Area to inspect, repair, or install your electrical wiring. “Safety First” is a prerequisite in any electrical wiring installation. Having a handyman install or repair your wiring to save a few dollars comes at a great cost, especially when an electrical fire starts or someone gets electrocuted. I have heard of insurance companies not covering a homeowner or business owner for work that had been installed by non-qualified personnel. Feel free contact Sparks Electric at www.SparksElectric.com or email us at info@SparksElectric.com for any electrical questions you may have. Thanks for visiting out blog post. This entry was posted on Monday, June 27th, 2011 at 12:10 am	and is filed under Uncategorized. You can follow any responses to this entry through the RSS 2.0 feed. You can skip to the end and leave a comment. Pinging is currently not allowed.